This was for sure the most exciting run I have done to date. Not so much due to the rapids but more to the mishaps which took place on Brian and my attempt of a mid- winter back to back Upper and Denny run. In this outing we left Weaverville at about 8 o’clock making stops to look at the flows of Canyon Creek and the East fork of the North fork of the Trinity in addition to some bagels and coffee at the Straw House. This in combination with some equipment repair at the put in kept us from pushing off on our first attempt of either run (nine miles total) at 11:30 in the morning. I might also ad that I was boating my new M:3 at the time which I had only actually used two other times. 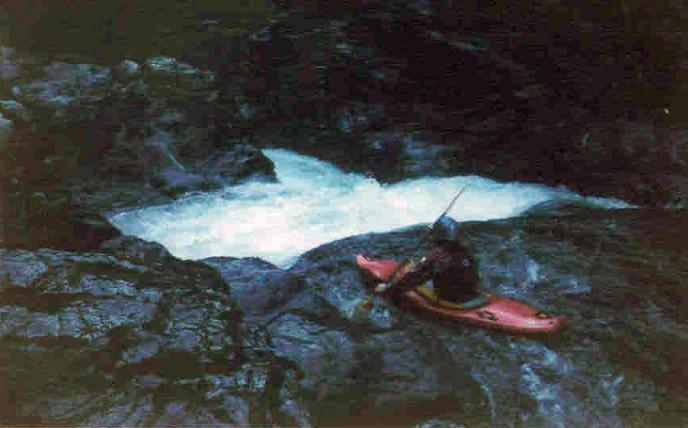 Continuing, we had a low flow that day of about 400 cfs. 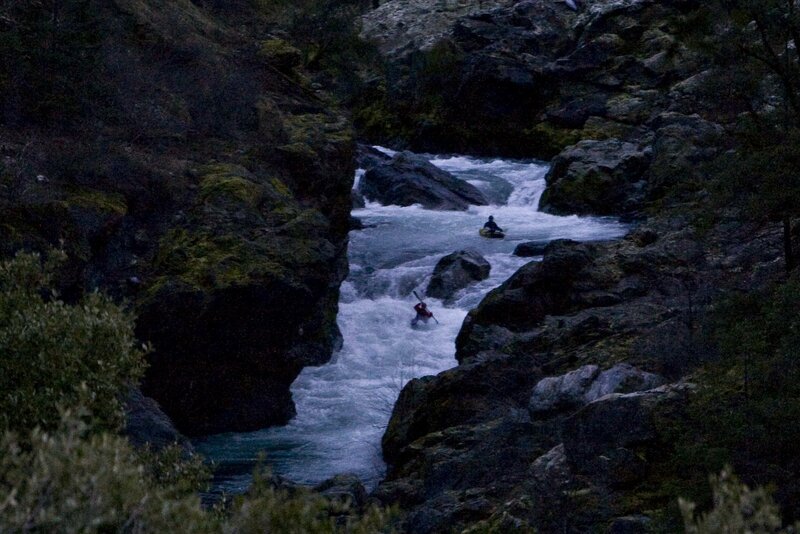 The day was progressing fine, we portaged the first large rapid of the gorge section due to insufficient water. We scouted numerous times due to the virgin experience. And portaged an easy entrance to a boulder garden to ensure correct placement further down rapid. All of this resulted in the day progressing slowly and our day light hours ticking away. This wasn’t a concern until at the end of another long boulder garden I pitoned and immediately pinned on the same hidden rock. 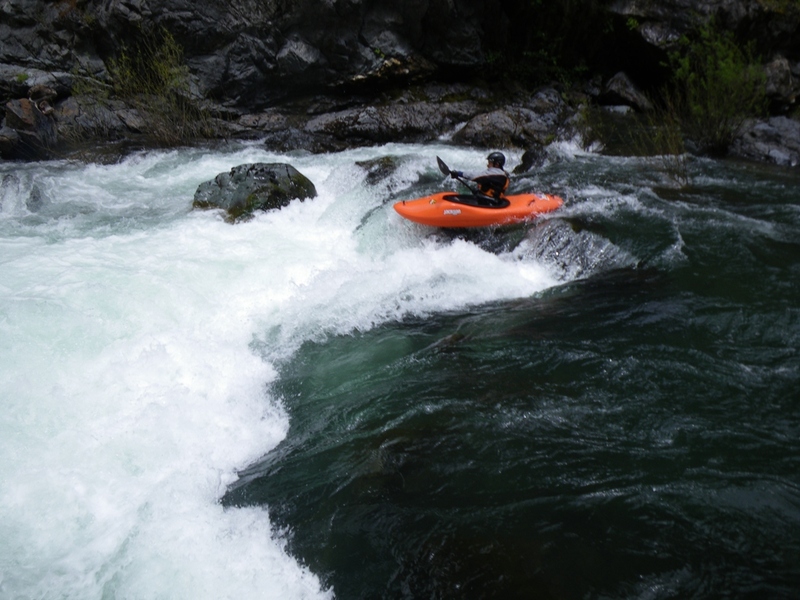 Without much hesitation (specially once my squirt blew) I exited the kayak and began to tug it loose. With these tugs failing, I decided to hop on the shore two feet away and tug from there; shortly thereafter I dislodged the completely submerged boat. This resulted in the boat being now full of water in a fast current so after almost being drug back into the water with the boat, I had to let it go and begin to chase the boat through the 40-degree water and 45-degree air. Right here I would be saying thankfully I had a dry suit, but instead I was in thermal underwear and a dry top. So after about a third of a mile, hypothermia began to kick in. This is when I (completely exhausted and a drenaline crashing) gave up on the boat and turned just in time to see one of the sandals I had stashed in my boat float by. My partner caught up to me after a thirty-minute ordeal of his own (portaging the unknown to him hazard that had got me). This is when I began 400- foot climb out of the near vertical gorge. 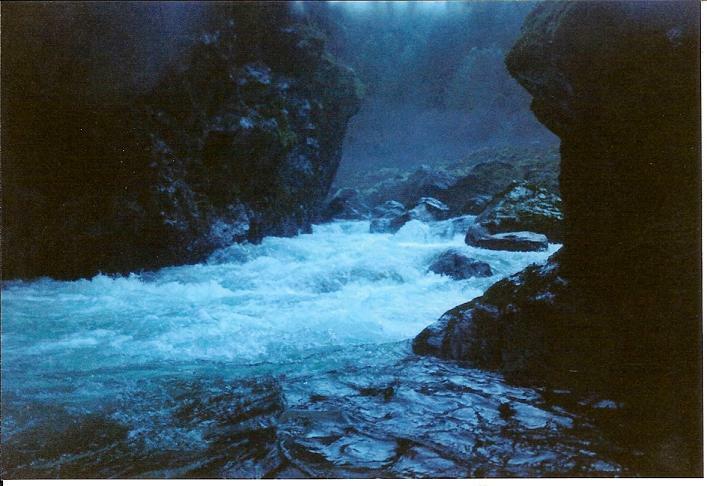 This gorge was made of three types of ground, loose gravel, loose boulders or poison oak. So after trying my best at the first two and setting off many landslides and a few near “Daniel Slides” I resigned to climbing up the poison oak groves on the side of the gorge. After reaching the road above, I began the four-mile hike back to the car at the put in. This is when a car came by. Now this is tricky, it would be easiest to ask for a ride to my car (as I was trashed from the experience thus far) but for those who have seen the movie “Deliverance” in addition to knowing how in the middle of no where Denny is, you may understand my anxiety in doing so. However, I got the nerve and asked for the ride which they kindly gave me. Finally back at my buddy’s car, I drive to the take out and hope my buddy gets out by dark. Shortly after the sunset, my buddy comes walking up the take out with good news, he found my boat. The news he brought then got better as he told me he found it pinned (and only slightly broken he added) about half a mile downriver from my departure point. He also then added the part that actually made it good news, he toed my boat behind him through 2 miles of class II-III water until he got to the ranger campsite where he left my boat on shore for us to hike down to and carry it out that very evening. With the help of flashlights we were able to accomplish just that and my “New M:3” became the seasoned expert it is today. 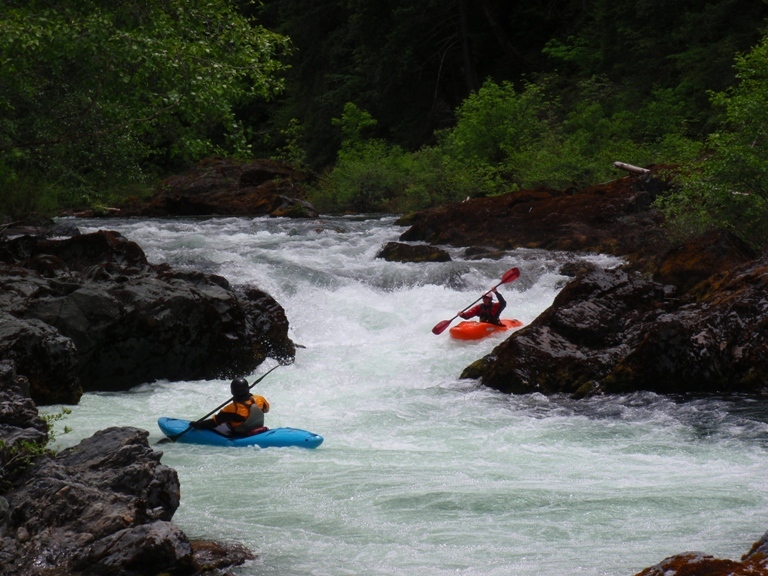 This run is listed by many resources to have a portage, however all the rapids have been run. In addition, non of the rapids have names that I know of therefore generic names shall be given. The first mile of the run is merely gravel bars that can be a bit shallow and bouncy at lower flows. Scout both of these on the right bank at the same time. Part 1 (IV). 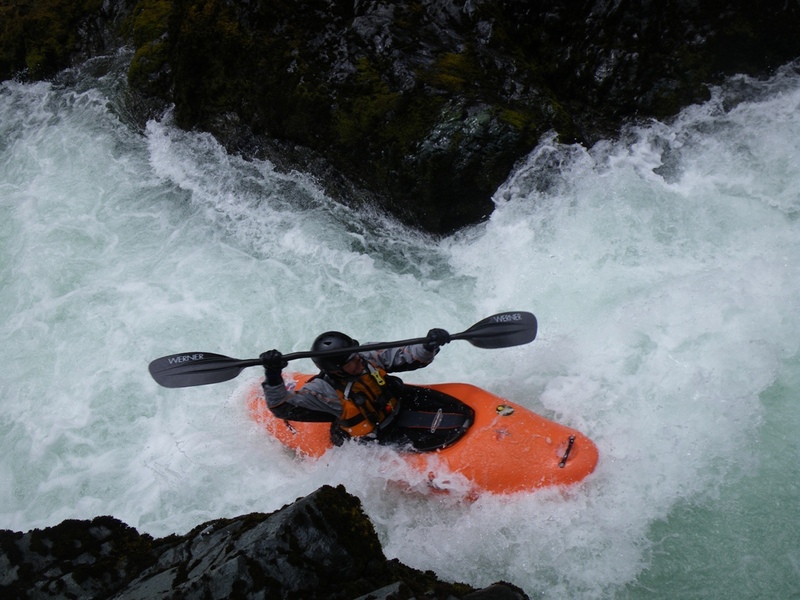 The first larger rapid is a short one that flows nearly directly in to a wall. This is the rapid we portaged at low water cause all routes looked to be choked with partially or fully submerged rocks. At higher flow, it was no problem. Long Rapid 1 (IV). This rapid’s can be scouted from the left bank pretty easily. It consists of a hole or two to enter, then a move around a poor over rock. From here at low water you must move far left and boof down a flake. 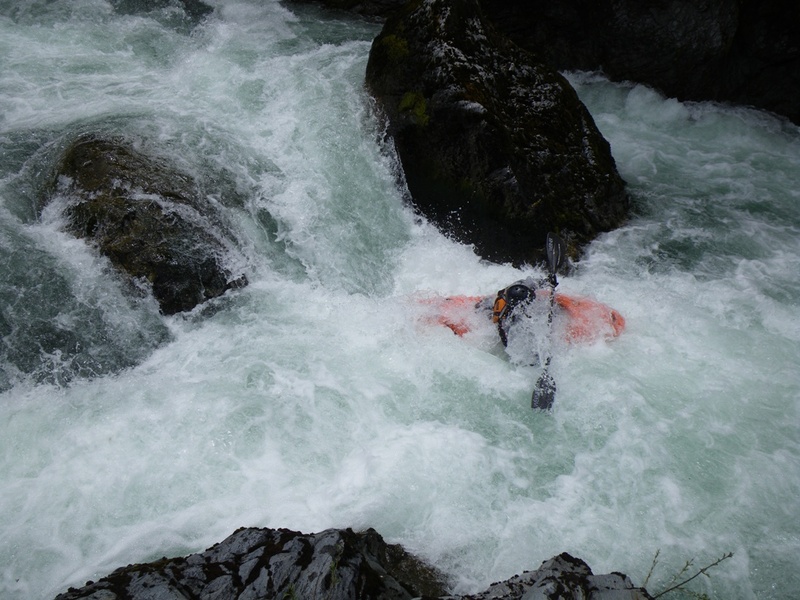 The boof helps with the landing because the water goes subsurface and could send you for a swim. There is a sneak when the water is up that avoids all the holes. Short Chute (III). 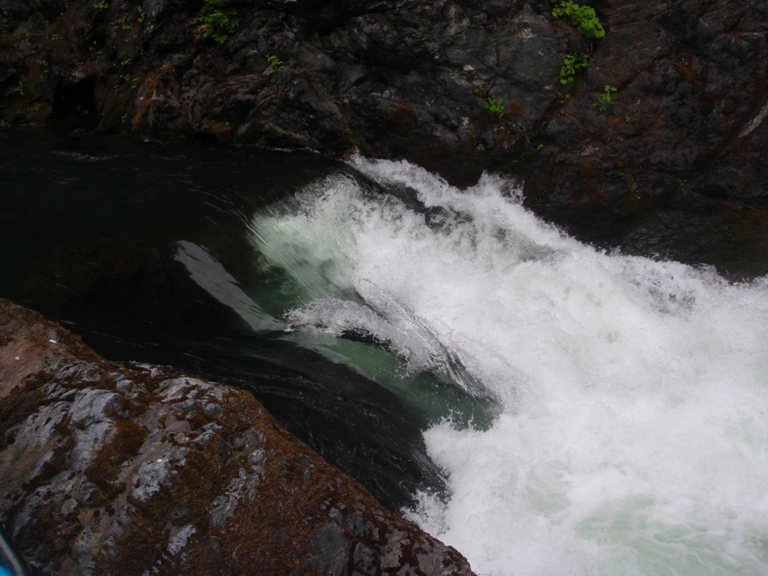 This rapid is in a steep part of the gorge and can prove to be a little difficult to scout (as I remember) so we didn’t. It was entered center and ridden out. Ledge (IV to IV+). 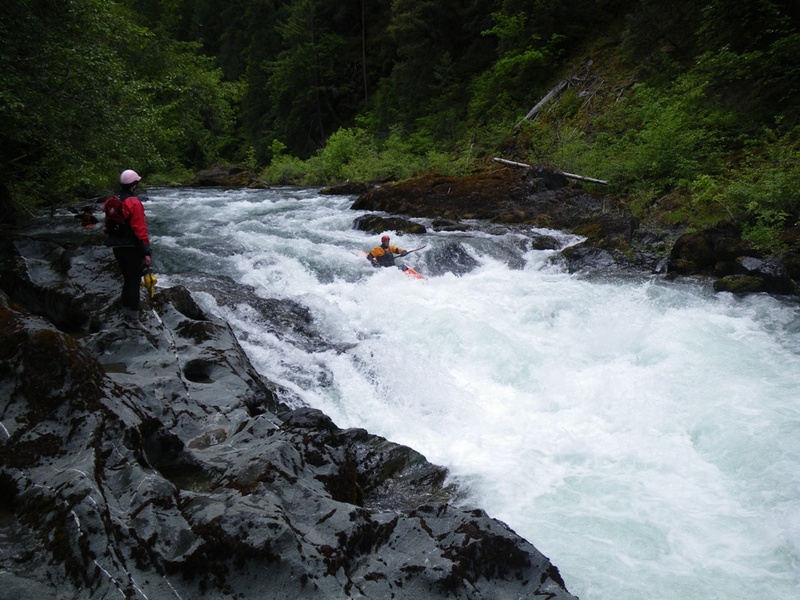 At low flows 7 years ago we portaged half of this rapid (which was a pain). Now the river must have changed as the drop is split by an island. The right is a bit junky and the left is a ledge hole. Easy portage down the island and moderate portage on the right. Hand of God (IV+). 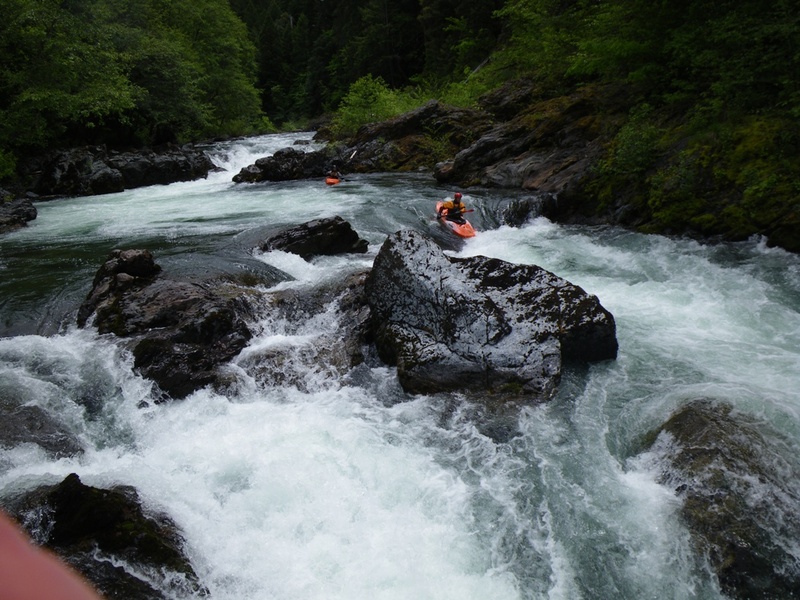 There are 3 parts to this long rapid. The first we ran down the right which then deposits you into a large river wide hole. 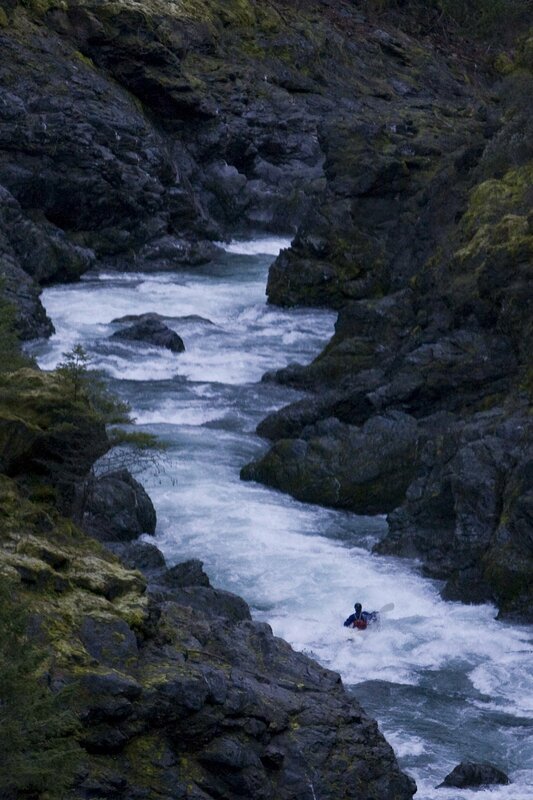 This then leads directly into the next rapid which we also ran down the right and ends in a drop of a few feet. This then feeds into “Hand of God proper. 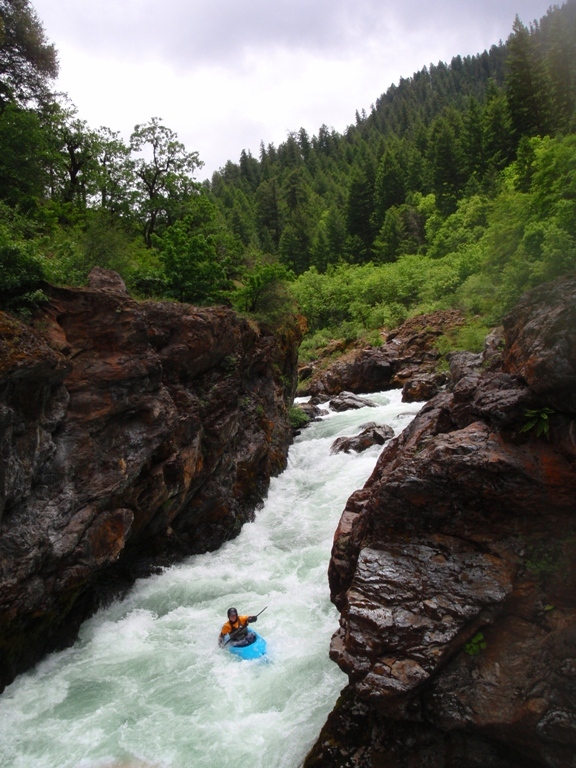 The river goes over a ledge on the right or hits a cushion on the left, makesa a 90 degree turn and drops over a ledge into the flow coming in from the right, thus making another 90 degree turn this time to the left. 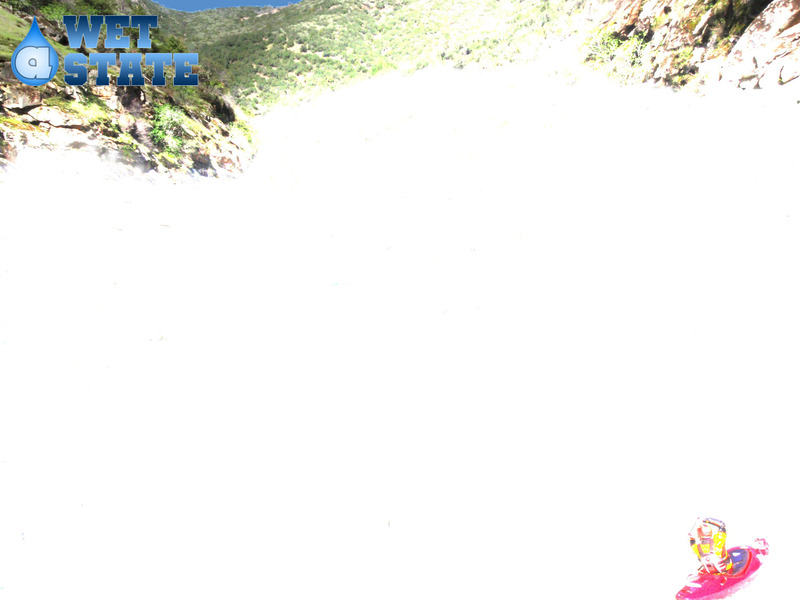 There are undercuts not far below but at both 400 and 800 cfs they were not a hazard. 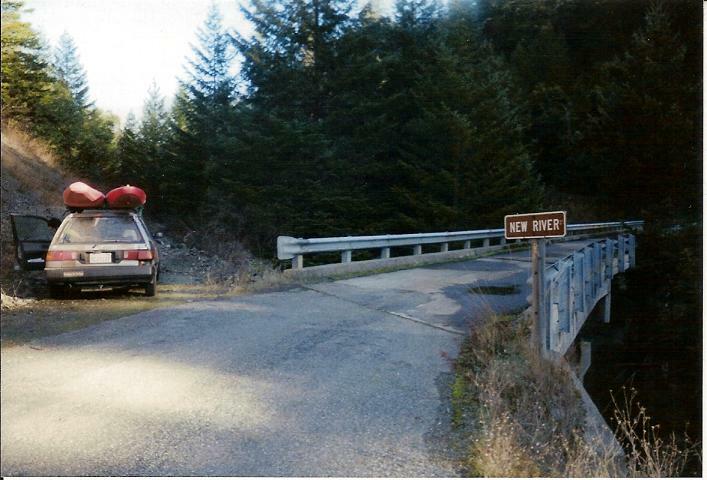 This rapid is nearly impossible to scout from the water so if you want, you should take a look by finding the trail from the road prior to putting on. 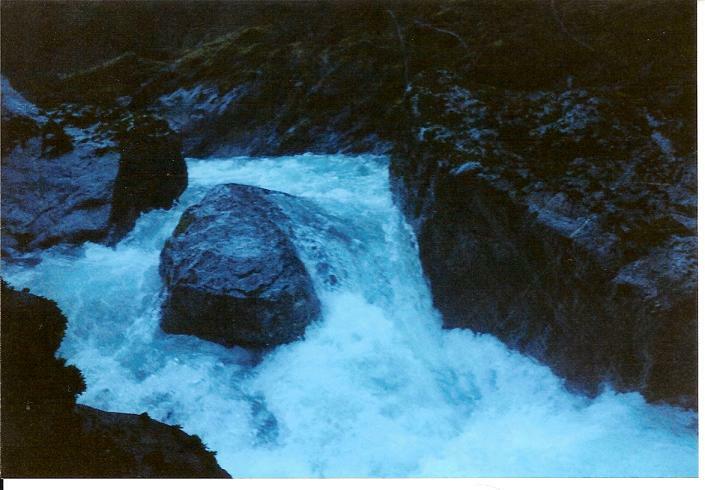 Long Rapid 3 (Daniel’s Folly) (IV). 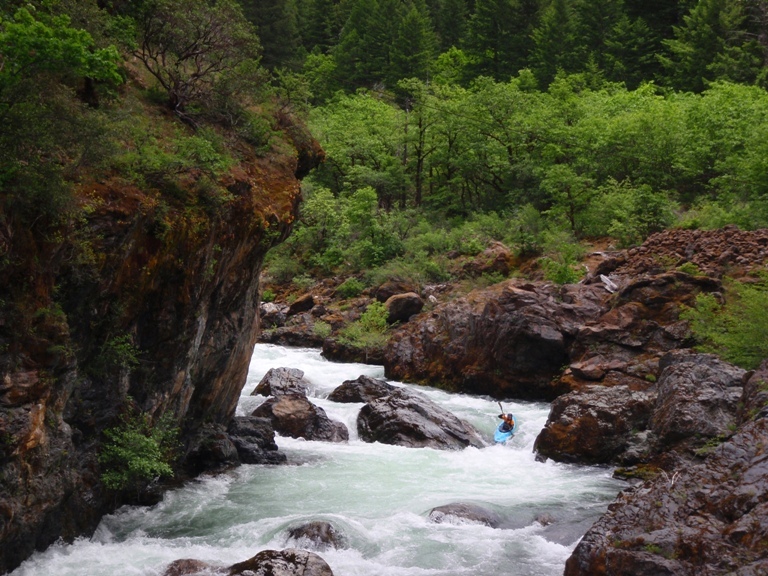 This rapid has an easy entrance including the usually bolder bar holes and rock dodging. At the end you have to decide to go right or left. We chose right around the mid river rock. There is a submerged rock in the hole part way down this chute. I never did get a look at the left side. At higher water there would have been no problem with the right side. Just downriver there is a small rapid which has a nice tongue on the left side. 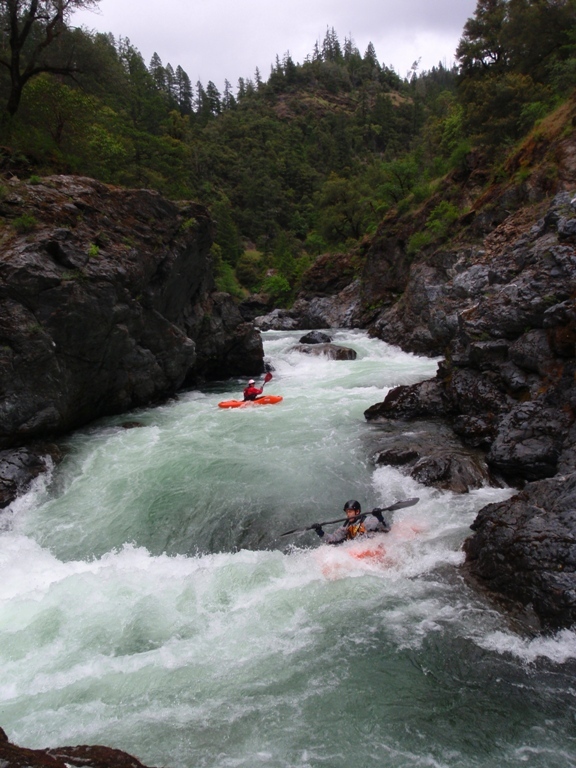 The right is the side you want to go to, even at 800 cfs, the left side was a bit tight and pinched between some rocks. The last bit of this stretch is easier, there are a few class II-III rapids but nothing that you couldn’t boat with an extra boat attached to your back (thanks Brian). Take out: Just North of the school in the town of Denny, turn and follow the dirt road. The bridge mentioned by many is washed out so it is best to walk down to the river and take a look at the take out. Put in	Drive is four or so miles up stream at the first (possibly only) bridge that crosses the New River. Room for one car on near side of bridge on left, this is also where there is a short 20ft trail down under the bridge to the river.